An extract from “A History of Histon Feast” by J. Whitmore. It is early July. In Histon the schools have closed for the long Summer holidays and the children and their parents are looking forward to the most important days of the summer. Histon Feast is about to begin and for the next four days there will be many events to attend. Some have managed to earn some extra spending money by fruit picking, others have been saving for months. The houses have been cleaned from top to bottom and all round the Green the walls of the thatched cottages have been freshly lime washed. Special meals are being prepared for all the relatives and friends who are visiting the village for the celebrations. Many work in service or on the land in other towns and villages and this is one of the few times of the year they can return home. They arrive by every means of transport: train, bus, brake, pony and trap, bicycle or even on foot. Some new clothes have been purchased or made for all the family, and these will be worn for the first time at the special church and chapel services held on Feast Sunday morning. After the family roast dinner, everyone hurries out to see the Friendly Society’s Parade, a new event this year, which has been arranged to raise money for Addenbrooke’s Hospital. The Band from Cambridge leads the procession which finishes on the Green. There a service is held and the children fidget while many long speeches are made by the speakers on the platform. Then home for a special strawberry tea and out again to promenade the village and meet old friends. The village streets are crowded with people all in their Sunday best swapping news and gossip. Then on to the Green for the Sacred Band Concert where another collection is taken for the hospital. 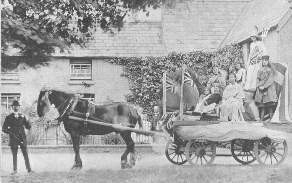 Many of the fair wagons have now arrived pulled by horses or steam traction engines; they are lined up in Station Road and Impington Lane. They should wait until 6am on Monday morning when they are officially allowed onto the Green; but as soon as the concert ends there is a rush of vehicles and much jockeying by the stall-holders to get the best pitches on both sides of the road. There is a complete transformation of the site in about two hours. Thurston’s Fair opens on Monday afternoon and “is patronised by Families of the elite, who wish to avoid the rough and tumble of the evening.”! All want a chance to ride the steam gallopers and ostriches and here the popular tunes of the day played on the steam organ. Those that work for Chivers have the afternoon off on Tuesday; and the crowds are largest at the second of three cricket matches in Park Lane and at the fair that day as many come out from Cambridge and from the surrounding villages. Special buses and trains run to and from Histon each evening and these are packed with visitors. In the new schoolroom on Tuesday and Wednesday evenings, a soiree organised by the Philo-Union is held. Up to a hundred couples “trip the light fantastic”, from nine until the early hours of the morning, to the music of Smith and Dring’s String Band. The public houses are doing a roaring trade and extra bars have been set up so all can be served. Young men purchase water squirts, confetti paper teasers and use them to great effect on the eligible girls in the crowd. “The roadway is red, white and blue with little paper discs. Worst of all the more frivolous girls pick out their favourites and empty a tube of water down their necks.” Many a love match has started this way. Having given pleasure to many, the fair closes at midnight on Tuesday; but not before Arthur Claydon of Newmarket Road has fallen out of a swing boat and been taken to Addenbrooke’s Hospital and detained with a severely cut head. There is another cricket match on Wednesday afternoon. But the fair is smaller, as some of the stall holders have already left for Linton Flower Show. At a quarter to midnight the fair steam organ plays “God Save The King” and the Feast is over for another year.